Oh my dog. Inner proofreader rage RISING. Love your strip. Always brings me a smile. Keep up the good work. Its nice to start the morning with a lagh. I don’t here anything wrong with they’re conversation atoll. Theirs allot of truth in what you say. 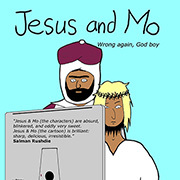 But if Mohammed (and Jesus) learned to spell, where would that leave their religious beliefs? Augghhhh!!! Today’s strip is having a very bad EFFECT on me…I’ll have no choice but to leave you, Author, if this keeps up. I have no COMPLIMENTS for you today. About language skills: it’s “its”, not “it’s”. All these mistakes and yet somehow The Grauniad remains free of errors! If you’ve ever had an exchange of posts with a fundagelical (portmanteau…not misspelling) then you’d know that the misuse of “it’s” and the misspelling of “definately” are small beer compared to their more egregious offenses against the English language. It can gets worse…a lot, lot worse *sigh*. I’m disappointed they didn’t say “athiests”. Anywon who dosnt find todays strip funy must be speling impared. Closet fundamentalists? Can you post a link to the study? I feel like I must be missing some misspellings in Mo’s frame 2 and 3? I was expecting denegrate and athiests, but I can’t find any errors. I don’t see any faults with Mo’s speech in Frame 3 but in Frame 2 he says “thats” when there should be an apostrophe before the ‘s’. I liked this cartoon a lot. @RavenBlack and Anthony G – Would I be flaunting my superiority if I said that I have found Mo’s error in frame 3? As a confirmed pedant I also liked this cartoon a lot. Well, Anthony G, he puts quotes around a non-quote. Even if it is a quote, it’s prefixed by two, non-included adjectives. I’m not too sure if that counts or not. John M: That’s not it. There’s a hint in Jon B’s post. May I suggest that the spelling mistakes and the flout instead of flaunt are deliberate? I go even further by being wondrous that Mo can think “their” correctly when so many people get it wrong. And by the way, I am German. Am I the only one with a sense of humour? @Neuseline – no, but your mastery of a second language puts most native English-speakers to shame. @Ravenblack – yes, ‘athiests’ – an enduring classic. ‘I’m athier than you!’ etc. Does atheist belief have a negative effect on spelling? Apologies for pedantry. Excellent strip. Does no-one recognise irony when they see it? Here here! No mistakes found in frame 3!!! Shame on anyone who thought the Author made all those mistakes intentionally! Where is your, uh, faith…? Mark D.: Did you notice the hotlink under the ‘toon? Interesting study, that. Pedantry: it’s just never funny, is it? Note to self – do not send smart alec comments at the end of a very long and tiring day on the basis of superficial scanning. Arse. Re Frame 3: did no one look at Jesus’ response? It should be “hear hear”. @Jim. “Flout” is mistaken usage so that makes 8. Interestingly Wiktionary cross-references it with the correct word – flaunt – as being a common error, so kudos to the writer of this strip for knowing it. Im sure yule loose allot of readers with this appauling abuse of the language. Oooh, the subtlety. The comments have set my irony meter quivering. I regret trading my irony meter for an iPad more every day. doesn’t iPad sound like something that Kotex would sell? LoL, to those several commenters in the first half of the above posts, I say, “Duuuhh!”. 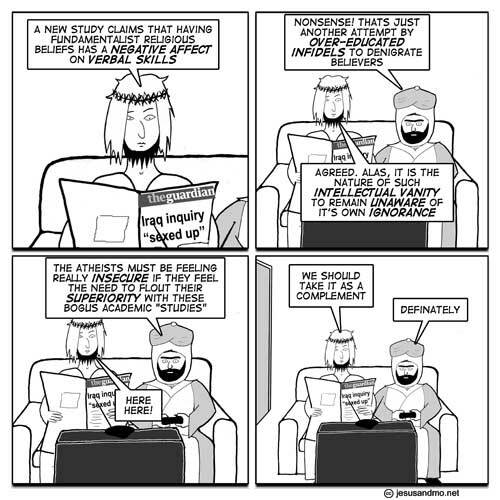 An atheistic view doesn’t necessarily equate to critical thinking, or deductive reasoning skills. The comments are funnier than the strip. Classic. The (deliberate) mistakes: ‘affect’ should be ‘effect’, ‘thats’ is missing an apostrophe, ‘it’s’ should drop the apostrophe, ‘here here’ should be ‘hear hear’, ‘complement’ should be ‘compliment’, and ‘definately’ should be ‘definitely’. Oops, and ‘flout’ should be ‘flaunt’ too. iPad is an existing TM for a bra padding, but the first time I saw the package on the ‘net a couple of days ago, I had your thought. BTW, they have sued for trademark infringement. Neuseline: As a half German I think that the point is that most English people think that we’re being serious! Maybe a good start would be a good English translation of Der Hauptmann von KÃ¶penick. Well, the basic point of it all comes to mind. I’m a week late, so my clever insight will be thrown away to waste its sweetness on the desert air. Ah well. Didn’t anyone notice the error in frame 1? Every *balloon* has an error. Is there any hope of reigning in such sloppiness? I don’t can find nothing wrong with J and Mo spelling. I think this study (at least whatever I can glean about it from the article you’ve linked here) suffers from “post hoc ergo propter hoc”. Correlation does not equal causation. But yes… the correlation could be suggestive of some sort of causal link. We’d just need more study to establish it. Nice too see this comic makes sense irregardless of you’re native tongue, that’s true even with less deliberate typo’s. Yes, that Mein Kampf was a real riot. Holy crap! I’m glad the commentariat has improved somewhat here in the future. Now we get mostly people who don’t need every joke signposting to understand it – though we do still get the occasional numpty..
And all of you self-professed pedants bring shame on the word. Pedantry 101: don’t criticise a joke about poor language skills among fundamentalists by correcting the poor language skills of the fundamentalists. Smartalek; Hitler was Austrian. And I don’t think he ever self-identified as a comedian. What was I saying about the occasional numpty here in the future?